That was Chiko's life before the day she found the cell phone. Before the voice on the other end said she had scant minutes to save the life of someone she'd never met. Now, accompanied by her classmate, Bando, Chiko has just one night to stop a series of gruesome suicides before they can occur. Line was published in English by ADV Manga on October 10, 2005. "A single cell phone. That's all it took... to drop me into a deep, dark hole." At only a single volume, Line has a limited space to fit its ambitious concept into. What results is a fast-paced, frenetic, somewhat haphazard but ultimately compelling story about the value of life and the power of one person. While the story can seem a bit thin and disorganized and thematic exploration is limited, to say the least, the brief chapter count, quick pace, and inherently compelling subject matter make it hard to pass up. Line's strength is in its core concept, which managed to take much of the danger out of a "game of death" premise without losing the bulk of the suspense or drama. Plot progress is fairly sparse, with about one point of development per chapter and the rest of the time spent on characters running around at top speed. It follows, then, that its weakness is in its focus on the running rather than the implications. The manga never bothers to name the people Chiko is seeking to save, or to explore the reasons they need saving. They're implicitly brushed off as inconsequential with a cry of "Well everyone has problems!" Task's identity and motivations are brushed off and glossed over with a line or two of inadequate explanation at the end that really don't give enough information to satisfy or even spark the imagination. Line ultimately relies on the reader's prerogative to mull things over in the aftermath, but is sparse in the delivery of salient plot points to think over. The art of Line is similar to the plot: good, but not great. The character designs are somewhat generic but cute and nice enough to look at without being inappropriately cutesy, and while the art tends to be rather stiff much of the time, it conveys the plot well. The backgrounds are detailed enough for one with a knowledge of Tokyo geography to recognize the setting of various scenes (for example, Shibuya Crossing) without being so cluttered as to distract from the characters as they rush about. It's good enough to get the job done, but there's nothing really special about it. The issues of characterization and character development in Line is an odd one. Chika seems like a fairly straight forward character: a calculatedly popular and stylish girl who learns about the a darker aspect of society and the value of life over the course of the plot. Still, the story tosses in random traits that seem intended to round out her character but ultimately seem puzzling in their lack of relevance -- for example the fact that she only pretends to be endearingly clumsy (but has klutzy tendencies nonetheless), or a baffling throwaway line about how she's working hard to get along with her stepfather. What was that all about, anyway? Bando is an even more hopeless case, with practically nothing being explained about her character. The readers knows there's a rumour she's a lesbian -- but that goes nowhere. She smiles in inappropriate situations -- but an explanation isn't even hinted at. Aside from her being a model student, there's really nothing to characterize her with. It's hard to believe a handful of pages spent doing nothing but running couldn't have been put to better use with a bit of basic character development. But while Line can seem a bit sparse in its core elements, just scraping by with a passing grade, it's hard to begrudge such things of such a quick read. And it's quick not just for its limited chapter count -- the frantic, kinetic disposition of the characters and the story itself demand a quick move from panel to panel and one page to the next. Even if the story doesn't reveal much, the desire to know just what will be revealed is hard to resist, and the single volume is all too easy to devour in a single brief session. Although Line leaves much to be desired, it is definitely the kind of work one can get more out of than was put in, and even if only for that, it is well worth the paltry timespan it'll take to read. 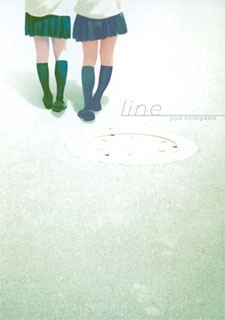 Line is a short manga, with a simple but fascinating idea. A bunch of suicidial persons putting their life in the hand of a normal schoolgirl. The only connection between the girl and the guy who guides her is a cellphone. The story is deep, but not very complex. You barely learn something about the protagonists, and the reasons for the people who want to suicide are never told. But this is part the manga's appeal. Instead of trying to get tears out of the readers by telling tragic stories,you get to see the plot how you would have seen it in real life. Simply following the the happenings, without much looking back. The manga is fascinating and since it is a short read I would recommend it to everyone. I am sure you won't regret reading it. Line is a manga written by Yua Kotegawa and following school student Chiko as she finds a cellphone. Tormented by someone on the end of the line, Chiko is sent on a mission around her city to save people from committing suicide. This is a really intriguing manga with a solid concept. It's unique and I've never stumbled across anything like this before. The story was executed perfectly across its four chapters and I'm glad that it was as short as it was. Extending this manga would have caused repetition throughout it and Kotegawa managed to toe the line between repetition and plot point perfectly. Everything that happened, happened for a solid reason. The story moved on its own and had me on the edge of my seat and holding my breath here and there - it creates a tension that is not easily shaken off until the ending scenes of chapter four. I wish the characters had felt more developed than they were. There were a lot of moments in this that felt entirely unnecessary such as the lesbian focus on one of the characters that was dropped almost immediately after it mentioned. It felt out of place and didn't feel right at all. It was as though it was being used for filler which I don't particularly care for as an LGBT community member. If the characters had been calmer about it rather than making an object about it, I would have been fine with it, however, they did not and it was a little disappointing for a manga with such high quality content. However, overall, this is a really good manga. It's the right length for what it is, it's unique and intriguing, horrifying to a degree and tense. Kotegawa has created a small gem in the jisatsu genre and I'm looking forward to reading more from them in the future.